This software is meant for preparing the Seating/ Packing/ Contingent Bill of SSLC Theory Examinations. o Memory 128 MB RAM (minimum); 256 MB RAM (recommended). Double click on the compressed (zip) file ‘SSLCManager’. Then you just copy the Folder ‘SSLCManager <ExamName>’ and paste at ‘C:\’ Drive root. After copying, it should be like ‘C:\SSLCManager<ExamName>’. Inside this folder there will be 3 Files. You can double click the '_FE' file to invoke the software. If you do not have ‘C:’ drive (! 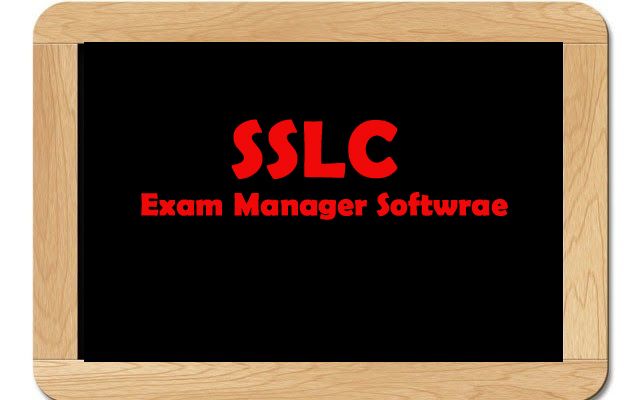 ), you just copy ‘SSLCManager <ExamName>’ folder and paste anywhere in the computer. Then you double click the 'FE' file to invoke the software and should set the path to the 'BE' file by selecting Tools-> Database Utilities->Linked Table Manager. Here Click 'Select All' and Click 'OK' and locate the '_BE' file where you copied (1st Time Only). If this utility is not installed in your computer, you please install and try. This s/w has two files Front End (_FE) and Back End (_BE). This is done for the purpose of networking. Invoke ‘SSLCManager<ExamName>_FE’ to start with ‘Gateway to SSLC Manager’. Enter School Code, Type ‘Place’, Kilometers to Post Office. You can Add/ view student list (Mark IED Candidates) – Basic Settings->Set IED/ Student List. Add student details manually. You can delete all records that you have entered at Trial time. For that you have to type User Name and Password together in the password column (eg: adminadmin). Don’t do this / give special attention, if you start entering the original data. Enter Staff details of all staff connected with this exam including Chief, Deputy, Asst. Supdt, Clerk, Peon etc. Enter Name of Staff and Exam Designation for that day. You can carry over these staff by clicking ‘Copy Displayed Data As above Date's Data’ button to the desired date. Then you can Add or Delete staff as you wish. Use ‘Attendance Form – Theory *’ (with 10 days’ columns) to get sign of Exam Officials. Enter the Name of Subjects conducted each day. If any student is absent enter his/her Register number. If more than one student are absent use separate row with subject. Don’t use commas. No need of entering Practical Absentees. Enter the Income and Expenditure as applicable (Allotment from PAREEKSHA BHAVEN, Postage etc). There is no need of entering the Expenditure amounts that are generated by the Software. Enter the Details of Allotment Amount from the PAREEKSHA BHAVEN with Receipt No./ Challan No. Select ‘From PAREEKSHA BHAVEN-Allotment’ as ‘Head’. While entering the postage charges for Answer Scripts, Enter the receipt No. in the ‘Bill/ Voucher No’ column, Subject Name(s) in ‘Particulars’ column and Select ‘Postage’ in the ‘Head’ Column. You can print Packing Slip and Absentees’ List. You can take Final Acquittance from here after the completion of Theory Exam. You can print the Attendance Form to mark the attendance of the staff participated in Theory Exam. It is a utility to just getting an understanding about expenditure. It gives only an approximate amount of expenditure. You can use it for scheduling the examination and to get students’ count (Subject wise) according to the Time Table from PAREEKSHA BHAVEN. It’ll help you to set Question Papers and Work arrangement of Asst. Supdts. Submit your Contingency Bill along with the documents listed in the Check List. It will be helpful, if you arrange documents in the order of ‘Itemwise *’ report. Attach additional documents, if you claim additional amount or you remit the Balance amount to the Govt. Attested copy of Fund Allotment Letter and Fee Remittance Challans are must to complete the Audit.